This article is a brief synopsis of the message that was given on Father’s Day, June 18, 2017. There is much more content in the audio file. Please share this on Social Media if you like this content by using the share buttons following the article. I hope this message will be a blessing to your life. Remember your children will do what you do, not what you say, so let’s build the kingdom of God. The Bible often compares the way we build our lives to the building of a building. He speaks of having a proper foundation, of planning how one will live and with this strong and urgent plea to be careful how we build our lives. Modern culture in America allows us the freedom to use our lives as we please. We can waste our life. Many do so by spending their life in pursuit of chemicals and pleasures that God forbids. Others spend their life in meaningless pursuits such as shopping, or golf. Others actually build with their life. They may build their body, or their “nest”, or a business, or wealth. But in the end all of that proves to be temporary. The best way to use your life is to invest it as a Kingdom Builder. We are instructed to build the kingdom of God, putting His kingdom first. “Seek first God’s Kingdom and his righteousness, and all the other things will be given to you as well.” (Matthew 6:33) If we put God first, He will see to it that all the other things will be given to us as well. If you build God’s kingdom, he will take care of you. There are four keys to building a great life. Four things we must do if we wish to build the kingdom of God. A building cannot be any taller or stronger or larger than the foundation that it was built on. It seemed like it took forever for the foundation to be poured when we built Fountain of Life in 1999. But once the foundation was ready, the building took quick form the next week when the steel arrived. Life is easier when you get the right foundation. If you want to have a great family, home and life the scripture tells us that we have to have the right foundation. Proverbs 24:3 says “Through godly wisdom a life, a home, and a family is built and through understanding it is established on a sound foundation.” You make God the foundation of your life by accepting the work that Christ did on the cross, and determining to life your life according to the Word of God. It is easy for us to get too distracted and busy and start short changing the important people in our life. It is hard to love when you are absent. When you stand before God one day at the judgment he’s not going to say, How much money did you make on earth? He’s not going to say, How many achievements did you accomplish? He’s not going to say, Were you a beautiful person? Were you the handsomest, the best looking, the most stunning person? He is going to ask you Did you love? Did you do what I put you on earth to do? Did you learn to love me? And did you learn to love other people? Loving others and loving God is what matters most. Time spent with God and time spent with family is an investment. Your family, friends, and loved ones are the only thing you can take to heaven with you. Be sure to love them. Who we have as friends will determine our destiny many times. Someone wisely said, “It is hard to soar with eagles, when you run with turkeys.” If we are going to be Kingdom Builders we need to choose the right friends. Friends that cause you to stumble, or cause you to live a life that is not moral in the sight of God are not really your friends. We should follow this advice from Proverbs 14:7 “Escape quickly from the company of fools; they’re a waste of your time and words.” This is not to say that we should not love them or care for them. But we must careful they don’t drag us down. It is harder to lift someone up than to pull someone down. People change quicker and better when they live life in community. That is why God created the church of the Lord Jesus Christ. So we can encourage one another to stay on the right path. Commit to a Great Cause and Purpose in Life. There are no great people in life. The great people are the ones who have had a deep commitment to a great purpose. The greatest purpose on earth is to build the kingdom of God. In God’s kingdom, it is not about climbing to the top. It is about serving. In reality God has built this into his universe. In order to be a great teacher, you have to serve your students. In order to be a successful restaurant, you have to serve your clientele delicious food. In order to be a great business, you must serve your customer by providing what they need. In the kingdom of God we are to serve. Every believer is called to serve God. To answer the call of salvation is to sign up to serve. We don’t have to be a pastor or work in a church to serve God. We do that wherever we are, whatever job we have. 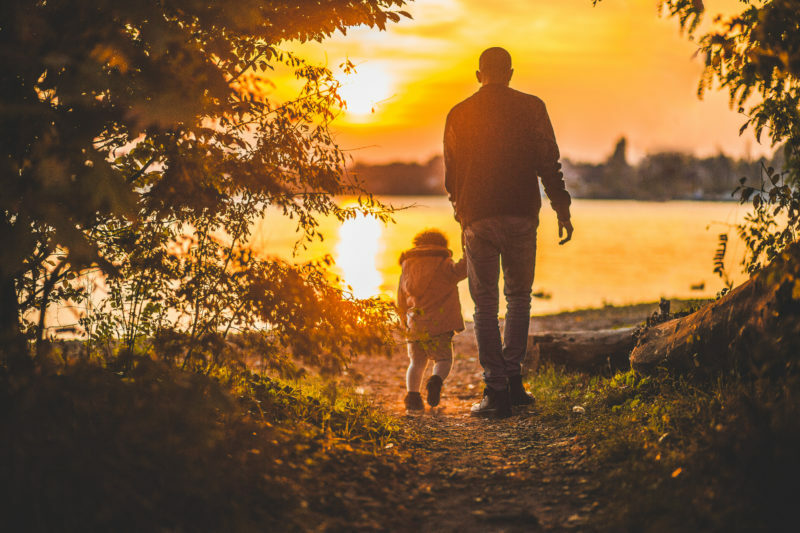 Dads especially can bless God when they decide to fully dedicate themselves to the great cause of the kingdom. To what great cause do you need to commit yourself? What are you doing to build the kingdom of God?